Appraisal: Got it today, should find out the results sometime late tomorrow or Monday. This appraiser seemed a lot more thorough and a lot less surly than the appraiser that we had for the Birch Street house: whereas the Birch guy cursorily snapped a few pictures inside, rushed outdoors to walk the dimensions of the house with a measuring wheel, and then took off, this guy spent a lot of time in each room taking measurements and making notes. We may not get the price we want, but hopefully we can get it close enough this time that we can make up the gap with a little money and a little negotiation. Electronic Voting Machines: As a software person, stories like this one drive me crazy. My primary beef with electronic voting is not so much the potential for fraud -- although I think that's quite real and should not be ignored -- but is instead the complete and total incompetence of the companies that build these systems. I think that voting is one of those things where, if software is involved, the technology has to be absolutely perfect -- just a notch or two below air-traffic control systems or medical devices. Yet the companies building these systems seem to feel entitled to take hundreds of millions of dollars from public agencies and foist the worst kind of untested, hackish junk onto their customers in return. And along with this lack of performance comes an incredible arrogance and lack of transparency -- witness Diebold and other makers refusing to share the source code inside their machines with elections officials because of the "trade secrets" contained within. C'mon guys, if Microsoft can share the code to Windows XP and Office, you can divulge the relatively puny "secrets" inside your machines. Do you not want people to see your Visual Basic spaghetti code? Or are you hiding something more sinister? Rebecca Mercuri is a good source of information on the problems with all-electronic voting systems and better alternatives. verifiedvoting.org has a large collection of e-voting horror stories. The Debate: I don't think that Kerry knocked this one out of the park, but I was pleased -- I think that he was solidly in control throughout, and was by far the more "presidential" of the two. I'm always shocked by how inarticulate our President is, and tonight he seemed to have particular problems with thinking on his feet. Post-debate, spinners were saying how this very inarticulateness works well with voters, helping to convince them that Bush is just a regular guy -- I'm sorry, but I don't want the man who has the most important job in the world to be just a regular guy! I can see why both candidates' camps wanted a prohibition on split-screen 'reaction shots' -- I think they worked well for us voters, but didn't do either candidate many favors. Well, we finally have an appraisal scheduled, for Thursday at 1:30 PM. It was a good thing that I hectored E*Trade into giving me the contact info for their planned appraiser, and then had our agent call the appraiser directly, because E*Trade's calling this a "super rush" appraisal only referred to how fast they were able to get the appraisal order out of their building. The appraiser told our agent that it was fortunate that we called, as they had been planning to schedule our appraisal for a couple of weeks from now -- because their office was really busy, and E*Trade had told them that they didn't need the appraisal until October 14th!
. . . and today I'm not even talking about politics. Rather, it's the only possible explanation for why Shall We Dance?, starring Richard Gere (gack) and Jennifer Lopez (double gack), will be coming out in theaters soon, while the original Shall We Dance?, the charming, understated, and very funny 1996 Japanese film whose script was cannabalized to make this Gere-Lopez-Susan Sarandon egopic, is no longer available on video. If your neighborhood video rental store still has cassettes, and they happen to have a copy of the original Shall We Dance?, rent it! This movie is one of the few reasons why we still own a VCR. With luck, any success enjoyed by the current film will get Miramax to pull the original version out of its dusty back-catalog vaults and reissue it on DVD. So one component of our housing deal (added by the sellers) was that we had to get the house appraised in seven days after the opening of escrow. Our agent got a testy reminder from their agent's assistant this morning that tomorrow is the seventh day. Of course, they burned up a couple of those days by dragging their feet on getting completed versions of necessary paperwork, but no matter. They've established a pretty consistent pattern here; they can do whatever they want -- wait all day before calling us back, respond to 5 PM deadlines the following afternoon -- but we're expected to perform on demand. On our side, our lender, E*Trade Mortgage, put in a "super rush" order for an appraisal on Thursday, and now ... nothing. I spoke with our E*Trade rep today, stressing that no, time really really was of the essence here, and she replied that she'd look into the matter, get on top of things -- all kinds of hard-charging, proactive sentiments -- and would call me back later in the day with a progress update. You guessed it -- she didn't call back! And now it's past five PM, and everybody's gone home for the day. We just got a box of books from Powell's Books in Portland, Oregon. The package was practically armor-plated: all of the books were shrink-wrapped tightly onto a thick piece of cardboard, which was surrounded in the shipping box by multiple layers of bubble wrap. Contrast this to the shipments we've received recently from Amazon.com, where the books are more or less bouncing around loose inside the box, and were manhandled by gorillas before they even made it into the package -- bent corners galore, scratches on the covers, weird black marks and scrapes (from rollers?) on the spines. If I wanted my books to look like they were eaten by wolves before I bought them, I'd just go shopping at the coffee shop/reading room/high-school study hall that is Barnes & Noble. We ordered enough to get Powell's free shipping offer -- and the books arrived in a timely manner! It took weeks for my last Amazon order sent via free "Super Saver Shipping" to even make it out of the warehouse. If it weren't for the Amazon credit card, and the lure of being able to buy the occasional CD, DVD, or electronic geegaw along with our book purchases, Amazon would be so gone. No, not really. Shelby already wrote about the total disappointment that was Oktoberfest at Torrance's Alpine Village. Had we actually paid $5 to get in -- and then paid $9.95 for bratwurst, and more money (another ~$10, I think) for beer, and so on -- I'm sure that we would have been even more disappointed; the whole event seemed very high-priced and low-energy. When it's not holding Oktoberfests, Alpine Village sells itself as something of a shopping center for the homesick German expats and Germanophiles of the Los Angeles area. 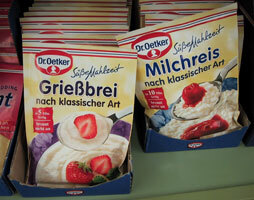 There's a German grocery store and deli. There's a German restaurant. There's a store selling German-language books, magazines, and videos. There are numerous stores selling German knick-knacks -- beer steins, cuckoo clocks, nutcrackers, and the like -- each of which could be dropped directly into a German tourist-trap town like Rothenberg without looking at all out of place. Is it really ... yes! ... visiting the grocery store gave the eerie feeling of being inside a Hamburg store's "American Food" section, only in reverse. A Very Boxy German Driving Experience -- Now Ram-Tough! In an interesting (at least to me) example of DaimlerChrysler synergy, the boxy Mercedes Sprinter van, common on the streets of Europe, has now come to America -- where, after what looks like nothing more than a swap of the front grille and the emblem on the steering wheel, it's being marketed as the Dodge Sprinter. I guess that here in America, if you're a plumber or an electrical contractor, you don't want your customers seeing you drive up in a Mercedes -- people will figure that you're a hoity-toity guy who charges more than his competitors. But if you spend the same amount of money on an all-American car-for-the-common-man Dodge, you're just an average guy who needs some reliable 'Ram Tough' work transportation. How long until DaimlerChrysler sends us its really interesting cars, like the Smart forfour or the Mercedes A Class? Shelby and I finally got the John Kerry T-shirts that we ordered from KerryGear.com in today's mail. 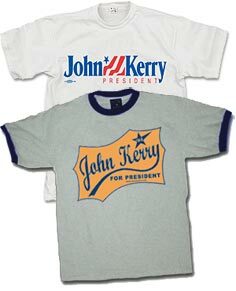 Shelby got the "Vintage Ringer"; I satisfied myself with the more generic "John Kerry T-Shirt". I sure hope that the people responsible for Kerry's merchandise fulfullment aren't involved elsewhere in his campaign, as delivery was sloooow, about ten days. You'd think that they'd want to get shirts and signs and other campaign tchotchkes into people's hands as quickly as possible -- especially now! Here in Democrat-safe California, I don't think that our show of support will change many hearts and minds, but at least it'll give me something to wear as I walk the dog around the neighborhood, past the house down the street with the Hummers in the driveway and the Bush-Cheney signs on the lawn. At the same time that we were buying T-shirts, we also donated some cash to the Democratic National Committee and the MoveOn PAC, along with some extra money to the Sierra Club (because if Bush does get re-elected, the Valle Vidal and other wildlands will need all the help they can get). Hopefully our dollars are doing some good out there, buying television ads or mailers in some swing state. We're officially in escrow on the new house. Neither of us is getting too excited, though, as there's still a lot of uncertainity over whether the new house will appraise at anything near the agreed-upon selling price. If it appraises too low, and the sellers are inflexible (as we believe they'd be), it's the Birch Street house all over again. The appraisal should be happening within the next few days -- stay tuned. Tyler, No! : Last month we celebrated as Tyler Hamilton, American and dog-lover, won the gold medal in the men's Olympic cycling time trial. This month he's been suspended from his cycling team after testing positive for 'doping' -- getting a blood transfusion to increase his red blood cell count -- during the Tour of Spain. Even worse, a first test of his Olympic blood samples showed that he might have been doping during the Olympics -- but a second test was inconclusive (the blood sample was damaged when it was accidentally frozen), so he gets to keep his gold medal. His team is rallying to his defense, convening a board of scientists (this test is a new test, and his is the first positive result), but it doesn't look good. Camera Corner: Now my digital camera, a Canon PowerShot G5, is definitely 'obsolete', as Canon has discontinued it in favor of the 7.1-megapixel PowerShot G6. The G6 looks like an awesome camera -- an evolutionary improvement over the G5 in every way (and not a hurry-up too-soon follow-on like the PowerShot Pro1, which seems to suffer from stuffing its 8 megapixels onto a too-small sensor area). 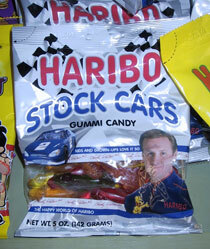 However, it's not enough of an improvement to justify (particularly to Shelby) my getting one. Although if the lineup can improve this much in just over a year, I can only imagine that the next digicam that I do buy will be able to levitate above crowds for a clean shot, and will divine the photographer's true intentions through the use of a direct telepathic link. In these contentious days of red-state-versus-blue-state turmoil, when dividing lines seem to split apart America more strongly than ever, don't forget to make your voice heard in an ongoing and divisive national debate. The professor behind the Harvard survey has since moved on to the University of Wisconsin and is conducting a new survey there; I haven't taken it yet, but plan to. Last night Shelby and I went to go see Sky Captain and the World Of Tomorrow. I approve! It's certainly not the Best Movie Ever, but it made for an excellent evening of escapism and was by far my favorite out of the (admittedly small) crop of movies we've seen in the theater this year. As expected, the visuals were stunning, a cross between Golden Age comic books, science-fiction pulp magazines, and every things-to-come article from every issue of Popular Mechanics and Popular Science from the 1920s and 30s. User comments on Sky Captain over on the Internet Movie Database show a lot of people panning the movie, expressing disappointment over acting and plot. Evidently these people have never listened to a 1930s radio drama, or opened a comic book -- pulp of the olden days is obviously what Sky Captain is patterned after, and on those merits, it fits right in. The plot -- and the characters -- are primarily there to move you along to the next Irresolvable Cliffhanger or Amazing Thing. Go see the movie expecting escapist spectacle, and you'll be entertained. Cities threatened by invasions of giant robots! Zeppelins! Airplanes that turn into submarines! Giant flying aircraft carriers! Hovercars! Gigantic Art Deco rocket ships! A sinister world-destroying plot controlled by an evil German genius! What's not to like? Film Corner: While we were in Germany, America wasn't doing much to live up to its Colossus-of-the-entertainment-world status, film-wise: we were served up with six months of lousy movies. Hollywood seems to be making up for it during the last part of the year, though. Sky Captain And The World Of Tomorrow may turn out to have no plot at all, but its visual style -- like General Motors' Futurama mixed with a stack of 1920s and 30s issues of Popular Mechanics magazine -- looks like enough to let me forgive it for almost anything. The Last Shot looks interesting, too. And then there's The Life Aquatic With Steve Zissou -- December can't come too soon! We put in another offer on a house today -- a real one, not an I'm-fishing-around-to-see-if-you'll-take-$50,000-less one. I don't want to say too much this time for fear of jinxing the deal (or appearing too hopeful), but the house is nice -- almost a hundred years old, but completely rehabbed ten years ago (so no worries about knob-and-tube wiring or a dodgy foundation). And it's in the historical core of a city founded by German immigrants! Who moved to California to make wine! Trains: I just got back a little while ago from a model train swap meet held in the parking lot of the All Aboard Model Railroad Emporium in Torrance -- just down the street! I didn't buy anything, though; Shelby will be proud of me. It wasn't so much a matter of saving pennies for the house, although that certainly helped, but more that I'm undecided about what I want; until we get a house and I once again have space to plan a layout and decide what goes into it. Scout Flips A Switch: Remember Scout's newly-developed annoying tendencies that I wrote about a week ago? Well, they're completely gone now. This week she's gone back to sleeping quietly in her crate, without any problems at all. One night I even started getting ready for bed, and turned around to find her already waiting inside the crate, ready for me to shut her in. We did buy a clicker and began a little bit of click-and-reward training, but we'd barely started before it became unnecessary. With no rhyme or reason, the good dog/bad dog switch in her head just flipped into the "good" position ... but we're not complaining. Real Estate Follies: We ended up making a backup offer on the Birch Street house, but have received no response -- perhaps our number was so insultingly low that the owners deigned not to reply, but more likely the owners are on pins and needles waiting for the second would-be buyer's appraisal to come back before they decide whether or not they need to bother with us. Maybe they're thinking that if this full-price offer falls through, they can put the house back on the market to get a third full-price offer! Yesterday we drove around Pasadena, looking at the outside various houses. Today we'll be going back up there to look inside some of those houses (Sunday afternoon is the big open house time; I guess that historically, people must've liked to roam around and look at real estate after going to church). After the houses, we went to Vroman's Bookstore on Colorado Boulevard and browsed around a little. Out of the independents I've been to, Vroman's is very good, but not the greatest; I'd save that title for Cody's Books in Berkeley, or the incomparable Powell's in Portland -- they get extra points, however, for also having a stationery and pen store a couple of doors down. We both like Pasadena. It reminds me a lot of Berkeley -- older, with an urban core but not hyperdense, and with a lot of cultural and educational things going on (you can bet that if we live there, I'll be going to some of the Art Center College of Design's "Art Center At Night" courses). It would be a nice place to live, if things work out so that we can. I just hope that we find something nice (and for the right price!) soon, though -- we're both turning into permanently depressed real-estate-listing-browsing zombies. Well, we got their counteroffer -- for $575,000. We put in an offer on another house yesterday. (Hopefully they'll get around to adding pictures to their listing later today so that all of you can see what it looks like.) It's only about fifty square feet larger than the Birch Street house, but it feels a lot bigger -- it's got a very open, airy plan with a lot of windows. It's in a better neighborhood. It's got all of the niceties -- hardwood floors, a fireplace, a pleasant back yard -- along with a kitchen to die for, featuring the latest in yupscale appliances (the range hood alone costs ~$800 on the street). However, there's a big chance that they'll turn around and laugh in our face, as our offer is $50,000 below their asking price (although we're still offering about $20K over what comparable homes in the neighborhood have sold for), and this house went on the market just last week. Their agent encouraged us to submit our below-asking-price offer, and said that the sellers were very motivated (they've already purchased another house), but all of us (Shelby, myself, and our agent) are getting a strange vibe from her -- are we being gamed here? Does she just want us to put in an offer so that she can turn around to the sellers and say "See? I'm working hard! Look how quickly I've started to get you offers!" Either way, they have until tomorrow to reply. Keep your fingers crossed. Yesterday I felt pretty confident that if this offer didn't go through, and if we didn't find something else we liked, we'd have another crack at the Birch Street house -- but well, maybe not. I noticed this morning that the listing status of the house has changed from "Active" to "Backup Offers Accepted". Looks like they found someone else to make a full-price offer. Will this person have the same problems that we did? Or will they manage to get a "better" appraisal, or will they just have a large enough stack of cash off to the side that any potential appraisal problems won't be an issue? Shelby and I were observing earlier how the failure of the house deal felt a lot like the end of a relationship. There were the no-way-this-is-happening feelings of denial and depression. There was the frenzied "I'll make them see reason!" phase -- I'll write a letter! I'll make a phone call! I'll say exactly the one perfect irrefutable thing that makes them see reason and puts everything right back like it was before! There was the rebound "I'll go see twenty other better houses! In just one day!" period. There was the compulsive looking back to a calendar that no longer existed -- "if only it hadn't happened, we'd be doing (Thing X) today ... (sigh) ..." There are the people who want to be consoling but Just Don't Get It, patting you on the knee and saying "well, if it was meant to be, it would have happened -- obviously God is saving you for your one perfect house!" I guess, then, that this is like going to the department store while you're still feeling vulnerable and seeing your ex with the New Person . . . smiling as they fill out their wedding registry together. One thing that's never failed to amaze me about IKEA is its consistency. I've been in ten or so IKEA stores over three different countries (the US, Germany, and Sweden), and they're all eerily alike -- the same products with the same goofy names, the same colors, the same signage with the same fonts, the same restaurant selling Swedish food in the center of each store, the same fights for dominance out in the parking lot. But tonight we discovered a chink in the facade of sameness. When we were in Hamburg, I purchased a sheepskin at the Schnelsen IKEA for Scout to use as a dog rug. In Germany, this sheepskin is known as a LUDDE, and it sells for 34.95 Euro. In the USA, however, the very same skeepskin is known as a RENS, and sells for $19.95 -- less than half the price! Why the name change? Was LUDDE deemed to be too close to a rude word in American English? Why the vast price difference? 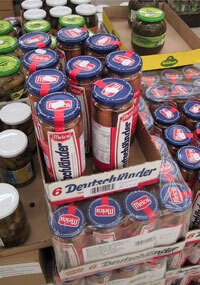 German IKEA shoppers can at least be thankful that they don't live in Italy, where the LUDDE costs 62 Euro! Last night was a sleepless one over here. Scout has been spending her nights in her crate, in our room; last night she decided that she really REALLY did NOT want to sleep in the crate, and spent all night telling us so -- brief interludes of quiet broken up by lengthier episodes of whining and scratching that we could not put a stop to, no matter what we said or did. We can't just let her out to sleep under the bed or wherever, because then she's 'won', learning that there is some threshold of whining and complaining after which we'll give in and she'll get to sleep where she wants. But we can't go on like this, either. It looks like this is going to call for some late-night clicker training, rewarding her for quiet periods spent in the crate. When we lived in Hamburg, she had been spending all night in the crate without complaint, sometimes not wanting out until 9 or 10 in the morning! I think that living at Grandpa's house has given her a certain spoiled sense of entitlement. And why do you guys want Scout in the crate, anyway? Well, crateless, she had been feeling that it was her God-given right to go outside every night around 2 AM -- and not heeding her late-night summons brought the danger of, um, accidents. In the crate, she'll wait until morning, which is reason enough to use it right there -- especially when we're travelling and she's crated at a hotel (although I don't know how often that'll be happening anymore, now that we're back in the States). In Other News: My sibling-in-laws, Brad and Katrina, are on the vacation from heck -- at least when it comes to getting their family back to California. They've spent this past week on a family Carribean cruise; on its return, their ship was supposed to dock in Orlando. For a while, it looked like Hurricane Frances was going to push them out to sea for a few more days (the big ships just sit on the open ocean and ride it out), but now they're supposed to dock today in Tampa. Thankfully Shelby's mom (travel agent extraordinaire) was able to change their return tickets from Orlando to Tampa, even with a Labor Day weekend and hurricane threats. But now the big news in SoCal is that LAX, the Los Angeles airport, has been completely closed and evacuated due to a pair of nebulous security threats. At this time, CNN is writing up the story as if everything's already been resolved, but that's not the impression we're getting from local news. On a more fundamentally worrying note, the house had numerous examples of do-it-yourself "cowboy" electrician work -- not only were there no GFCI outlets in the recently-redone bathrooms, but the light switch for the master bathroom was incorporated into the tilework around the shower stall! The woman who called an electrician about partial power loss in her house, stating that "the pennies in the fuse box may need to be replaced!"